California's New Digital License Plates Give You the Chance to Finally Be the "ASSMAN"
You’ve had that perfect personalized plate in mind for years, and some jerkoff already got it. Well, if you live in Sacramento, you’re in luck. A new pilot program for digital license plates has begun. 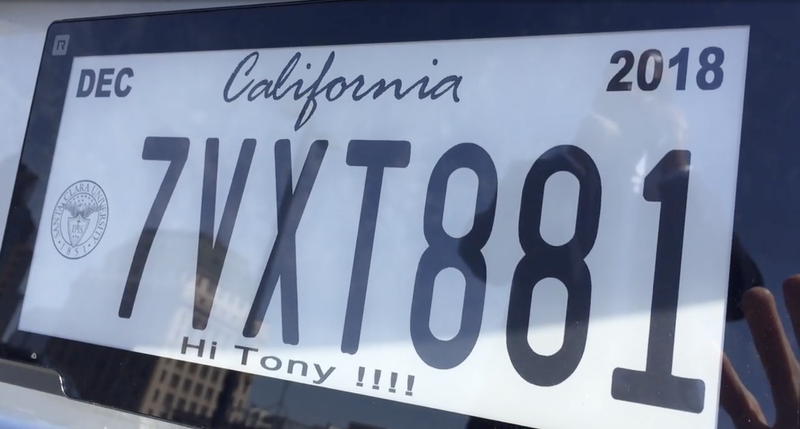 The plates allow you to display custom messages, eliminate annoying registration stickers, and even have your location tracked at all times. California has been working to launch a pilot program of the fancy new tags for years, and Sacramento has agreed to be the first city to test them out. The plates are essentially an e-ink display similar to a Kindle and when the car is in motion they look fairly standard. But a feature that’s experimental, for now, will allow you to display a message when the car is stopped. The actual tag number will still be visible but it will shrink down into the upper right-hand corner. Some businesses will use them as mini-billboards to advertise their products or services, he said, but will be able to do so only when the vehicle is stopped. Aside from the opportunity to display messages on the back of their vehicle, motorists will probably most appreciate the fact that they can register their car online and the date on the tags will simply update itself. Others might appreciate the pseudo-Find My iPhone feature. If the car is stolen, the plate will display the message “STOLEN” and as long as it hasn’t been detached, the police will be able to track the vehicle’s location. Of course, that raises the issue of whether or not people want yet another device tracking their location. Over the past few years, a string of events has chipped away at our right to keep our location private. The Supreme Court is currently reviewing a case on this very issue that involves a man that was connected to a string of robberies based on the metadata from his phone pinging nearby cellphone towers. Slapping a tracker on the back of every car obviously takes the issue to whole new level. The city of Sacramento is already dealing with privacy concerns surrounding the devices. It’s ordered 24 plates for its fleet of vehicles with the hope of being able to better keep track of them as well as display public service messages. But one official told the Sacramento Bee, the city will have to talk with labor representatives over concerns that the devices will be used to monitor city employees.